As Mother's Day approaches preparing to celebrate those ladies in your life is important. Celebrating moments, holidays and people, all with beautiful handmade cards is a great way to show you care. 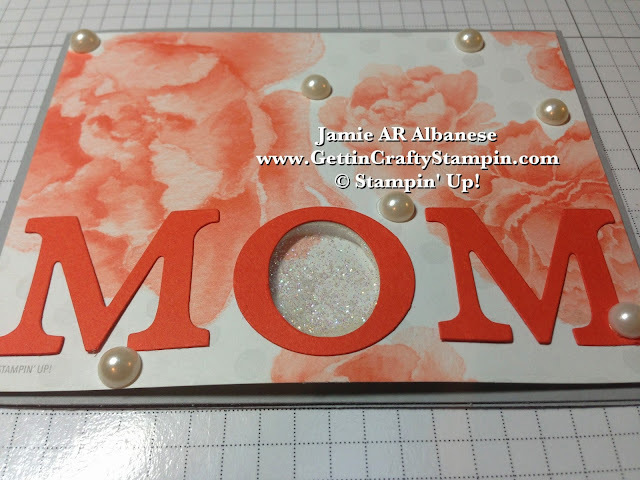 This Mom die-cut shaker card is accented with Glitter and Pearls to show how valuable that special woman is in your life! I LOVE our Shaker Frames! With a the help of our Window Sheets you can create so many cool effects! 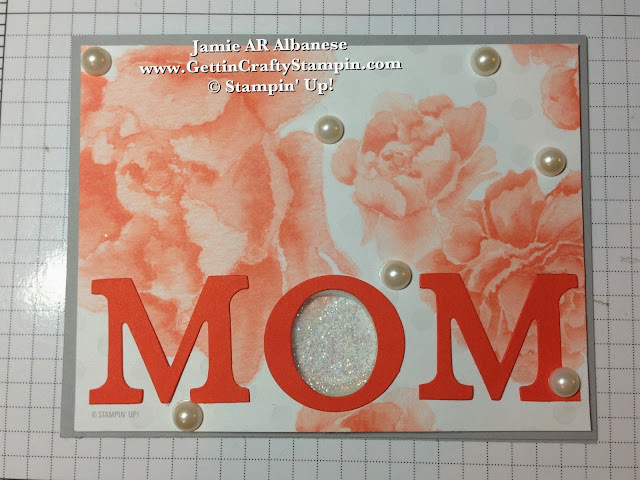 Here the Typset MOM in Tangerine Tango covers the Shaker Frame that holds the Dazzling Details Stampin' Glitter. Shaker cards are a unique way to create an interactive card. Stand above the rest with this fun accent on your projects!! Simply lay out the M-O-M die cuts created with the Typset Alphabet Dies and Big Shot over this beautiful Watercolor Wonder Designer Series Paper. 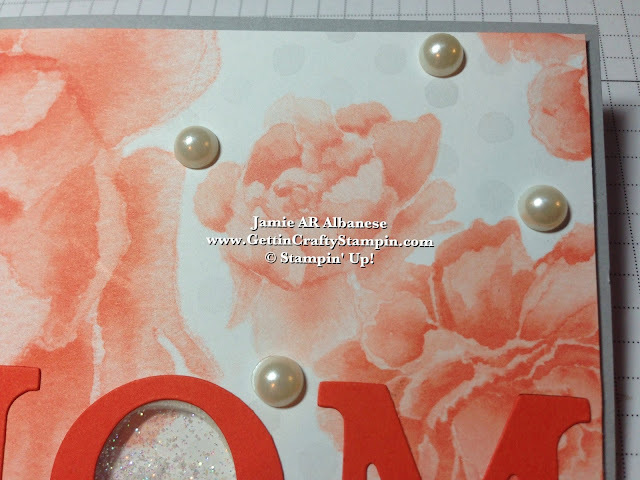 Move the 'O' and cut the 1-1/4" Circle Punch out. 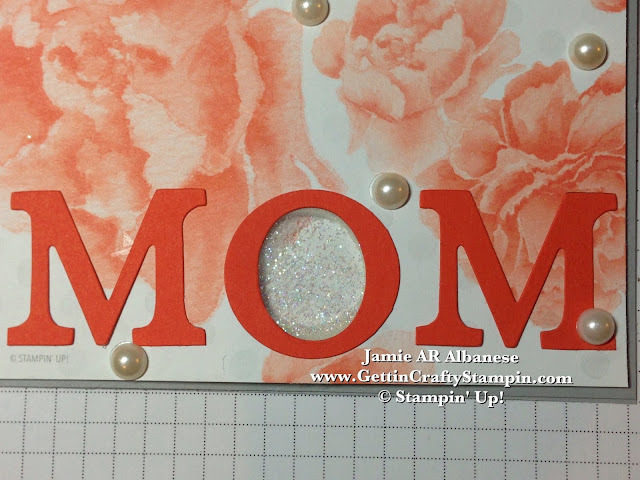 Don't toss that punched circle, use it under the Window Sheet, the Dazzling Details Stampin' Glitter for a cohesive look to this pretty paper. Moms add sparkle and beauty to our lives. This addition of iridescent glitter shows that they do add sparkle and beauty to our lives. This pretty paper has a subtle Smoky Slate polka dot pattern... accent this with our adhesive backed Large Pearl Jewels in a fun whimsical patter. The random placement ties this subtle background into the beauty of our Pearl Jewels! Sometimes 'Mom' says it all, doesn't it? I know, as a mom to 6 stunning kids, I'm so blessed to be honored with their care. Start NOW preparing for those special ladies in your life.. for me I'm blessed to have had strong women raise me (from an amazing Grandmother, to my Mom and my awesome Aunts). 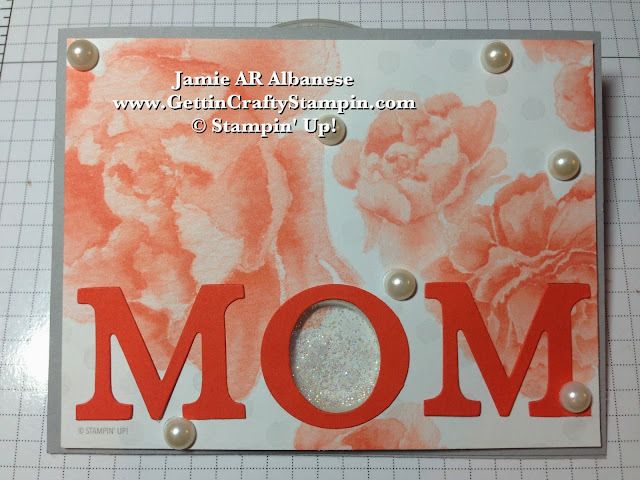 This handmade Mom Die-Cut Shaker Card is a fun card that will surely light up their eyes.